2010 flood | high road to..
Viewpoints : coming in to Leh in late October I was surprised , after the descriptions of the “flattened” Leh , to see the entrance gate standing. The path of destruction below the gate is impressive. Standing above it it´s nearly impossible to find any clues of what happened after the cloudburst on August 6th. The old town centre , where people woke up in amazement when the rains hit… and went back to sleep ,unaware of what happened in Maney Tselding , is virtually untouched. Walking around the royal palace the only possiblle traces I could find was a stretch of the paving laid out by the Tibet Heritage Fund damaged , and some broken steps leading to the court of the gompa below the palace. There was talk of a damaged wall in the palace , but I never manged to find it.The Hill Council had posted a map showing a secondary mud flow across the polo ground above the bazaar street , giving me concerns for the people I used to stay with on my first visits to Leh. Again , no traces left by this time. Walking up from the market to my Changspa guest house presented familiar views. The Changspa bridge was torn down in the 2006 rains , and this time it held. The banksof the stream have been undermined in a few places , and were being reinforcedduring my stay until it became too cold for cement to cure : this should be finished by next spring. Walking down below entance gate area became a reversal of my work role , starting in some ways to act as the next of kin : I knew it would feel better afterwards , but still hesitated. Present situation : the bus station area was cleared long ago , at the southern edge you can still see a line of houses which just has been clerared – this is where rocks and cars were tossed in by the mud flow.Higher up you find a line of stalls replacing the old shops. The Maney Tselding residents has been given new plots far away from any possible future floods , but this also place them far away from any possible trade , so the tented stalls will probably become a permanent situation – the Hill Council has banned construction in the area. 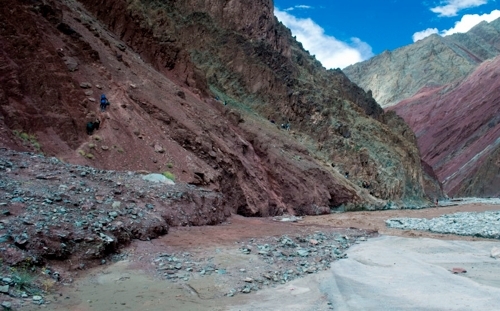 Maney Tselding was where the mudflow path started to hit in Leh. Further down it struck the Sonam Norbu Hospital , the BSNL telecomminication centre , and the aiport. In the beginning it hit a mani wall that literally got it´s last block of reconstruction in November. In the media presentation Maney Tselding became the representation of what happened in Leh , the camera eye rarely moved from there – see for example this news spot , which actually is a little better than many since it includes (without commenting ) the untouched bazaar street. The common factor is the incredible amount of pictures and video from within a one or two block radius : pictures of this single house , like this from Nana Ziesche ( yes , thats´s a car in the foreground ) got a huge coverage at the time. This coverage , concentrating on striking imagery ( including the excavation of bodies ) is a a sore subject today with many Ladakhis , at times getting close to anger. It also gives little chance for understanding even for people who have been to Ladakh : there were for example forum discussions saying on one hand that of course mud brick buildings had no chance to withstand events like this ,and on the other hand some pointing out pictures like this where traditional buildings had survived next to crushed modern , reinforced concrete buildings. Both views are fundamentally flawed in my opinion : there are practically no buildings that have a chance to withstand forces that toss buses trees and rocks the size of small cars . The only possible protection is understanding where you won´t come in the way of these forces , which is a form of knowledge linked to traditional building in Ladakh. Today the building in the previous picture has been cut down to the intact parts : the foremost room is the storage room for a glass workshop , the guest house behind is not working yet but in the same block the carpenter shop is up and running. The Google Earth view , based on imagery from October shows the boundaries of this media landscape – which is also where all my pictures in this post come from. This the Leh-only report : obviously this leaves out what happened in Choglamsar and many other places in Ladakh . It also shows the last remaining tents in central Leh, also shown in the Google Earth picture. Most of the emergency tent camps closed already in September , the housing efforts will be covered in a later post. Arrived yesterday in Leh from Manali – on the original route. Snow was not an issue , but cold was : after making excellent time ( three hours ) up to fifty meters below the Rothang , we ascended another thirty in the next four because of stranded vehicles from the night before. First one breaks down , then all fuel lines freeze – enter the classical scene with truckers making up small fires under their vehicles. Another similar stop just after the Baralacha La. Brilliant weather all the way , road just after Gondhla : “regret the inconvenience” . Excellent road after the Tanglang La ( one meter of snow , but well cleared ) just until twenty klicks before Lato , then good. 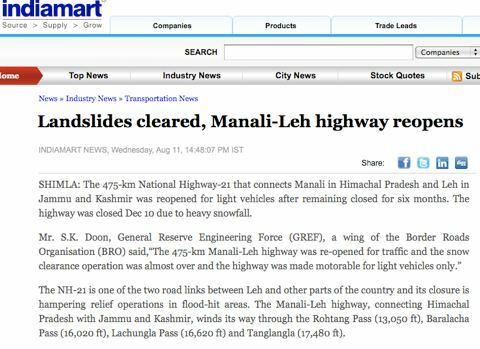 IANS today quotes BRO saying that the Manali-Leh highway now has light vehicles running , after some rerouting. The twenty kilometer steep downhill stretch to Upshi is still badly damaged by landslides ,as already described by a Malaysian poster here . On Aug 10, I and hundreds of other Ladakhis walked about 40km from Lato to Upshi. I am a Tourist cycling the Manali-Leh highway this year is forced to leave all my belongings behind with the villagers that is including my bicycle. I was told that by foot was the only way to reach Leh. The journey took us more than 10 hours. 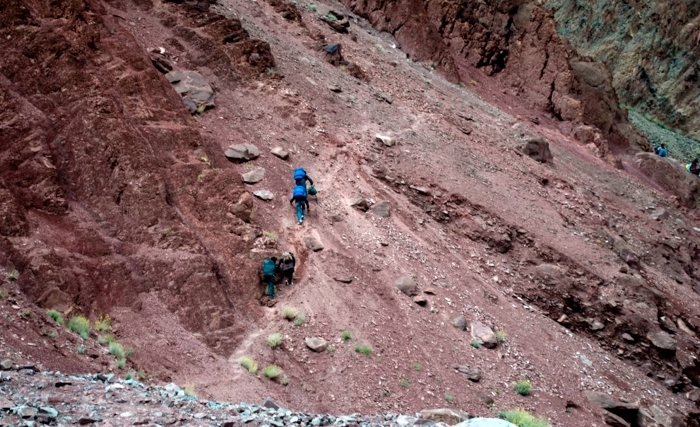 Trekking and rock climbing along the 40km route allow us to see the devastation caused by the rain. It was not only the landslide to be cleared off but in some stretch, the roads were totally ‘vanished’. Keylong weather forecast talks of around forty mm´s of rain per day between the 18th and 20th , Leh twenty mm´s. Tribune and others this evening are filled with the news that Srinagar-Leh is open … which seems to mean that the material for the last Bailey bridge is in place , and the BRO is confident to have this up by Saturday. The Kargil weather forecast has been revised , and no longer promises very havy rains , until the 18th. 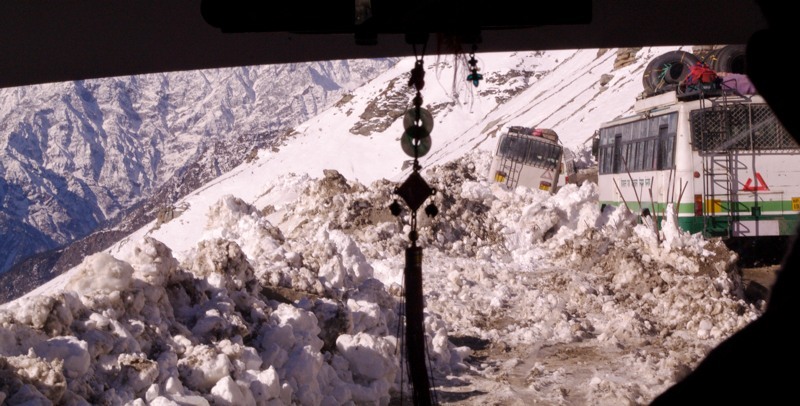 Conditions between Manali-Leh are worse , and a temporary re-routing around the major landslides is being discussed. Himvani among others mention the Manali-Leh highway now being cleared up to Sarchu . Keylong weather forecast talks of heavy rain the coming three days.The first solid info on casualties among foreign tourists in the Leh flash flood is also coming in : three named French tourists (confirmed from French foreign office ) , one Italian , one Spaniard and eighteen more . None of these have have been updated on the deceased list on leh.nic.in. The official death toll remains at 145 . Media mentions two French casualties , but there are some unclear points : they are not posted on the list of deceased at leh.nic.in , and there are no mentions of it in French media , at least with the names given by the ITBP . Weather forecast is bleak , a severe weather warning from IMD for Himachal and Jammu and Kashmir talks of heavy rainfall the next 48 hours. The Kargil district weather forecast talks of massive rainfall in the coming five days , culminating in 72 millimeters of rain on August 14th : don´t even think of this route this week. I was staying at a guest house in old town Leh. The rain came down so hard that I first thought hail was banging against my windows. I soon heard shouting in the streets. I grabbed my flashlight (no electricity in Leh at this point) and went out to the balcony to see that the ground floor of my guest house was filling with water. A neighbor and I went to wake up the owner and the other guests to warn them of the danger. The owner and his family frantically tried to blockade the door with a sheet of zinc and sandbags to prevent more water from entering the building. The water continued to rise as we tourists tried to quickly pack our most important belongings in the rain and darkness. The neighbors kept shouting for us get out of the house. I couldn’t understand why at the time. My instinct in a flash flood was to climb upstairs as high as possible. I only understood the next day, that the houses in Ladakh are often not built to withstand a cloudburst like this and that the neighbors were afraid the roof or the house itself might collapse. The water rose to about 4 feet at its deepest in the street, and about 2 1/2 feet in the guesthouse before the heavy rain stopped and the water began to recede. Locals said that they had never seen rain like this in 75years. It was only the next morning that the scope of the devastation became gradually apparent. All stores were closed and people began to move en masse to the the worst hit area of the bus station that was flattened by mudslides. When I arrived at mid-morning, 4 bulldozers were at work removing heavy debri. Along side them, hundreds of volunteers, both locals and many tourists, formed human chains to remove dirt and debri by hand, hoping that they might find survivors underneath the mud. Unfortunately, in the time that I was working there, only bodies were pulled out. Some roads were covered in mud and debri. The airport was closed, there was no electricity, and only one cellphone company was working. Most of the town was still largely intact though and tourists wandered the streets trying to find open restaurants and gathering in groups to share information. By Friday afternoon several cyber cafes had opened and very slow internet (via satellite) was available. That first day, (Friday August 6th) there was little sign of government or military presence in Leh. (There were places I didn’t go such as the hospital or makeshift morgue, however, where they may have been present). With a lack of any clear authority or organizing force, rumors and fear abounded. The skies over the mountains were dark and stormy on late Friday afternoon and a rumor spread that another flash flood was coming. People began to run and drive in a panic trying to find high ground. It’s easy to understand why. Given the death toll the night before, nerves were shattered. The news media arrived in Leh and Choglamsar on Saturday August 7th along with some aid and a more visible military presence. As of today (Sunday August 8th), however, there has been little news of the fate of people in the villages. Trekkers hiking into Leh, report seeing bodies of local people at the mudslides and I fear the death toll will be significant. 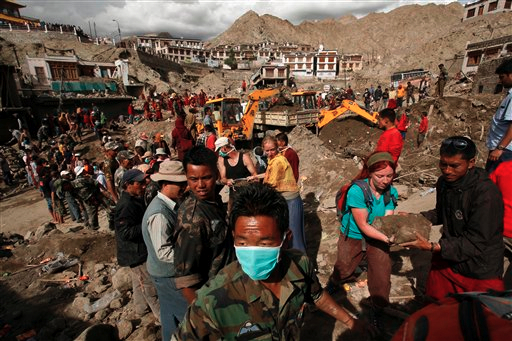 Dozens, maybe hundreds of tourists were also trapped by the floods in the villages and mountains. Efforts have been underway to rescue foreign nationals who are still stranded. I’ve heard unconfirmed (again unconfirmed, only third-hand) accounts that a small number of foreign trekkers may have been injured and/or killed. 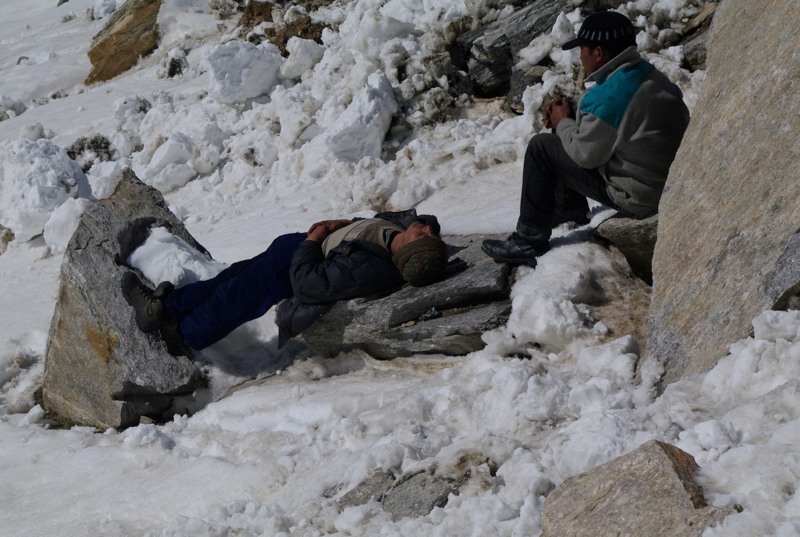 Those trekkers who were able to hike back to Leh have some harrowing stories to tell. What started out as a fun holiday trek, turned into a life-threatening ordeal in the space of just an hour of rain. 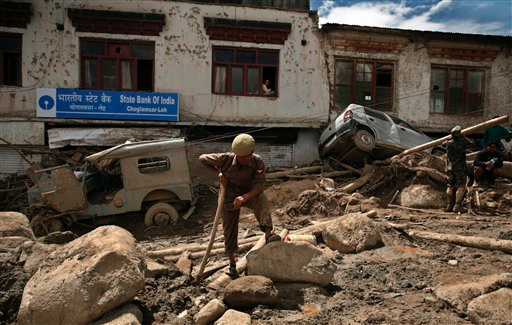 Leh photo , showing the area between the old and new bus stand , and main street in Choglamsar from Associated Press. 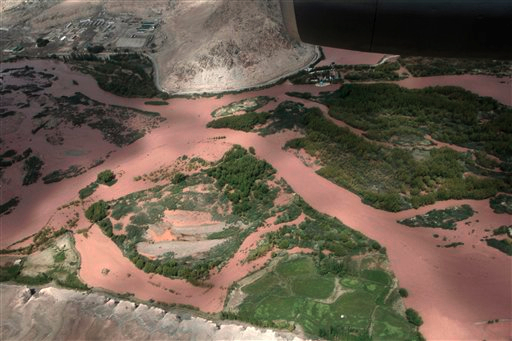 Air photo ( looks like the area between Leh and Shey , close to the Dalai Lama´s house ) from the Indian Army .